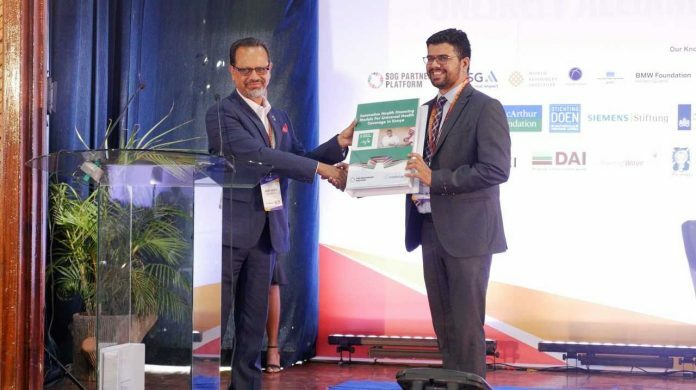 A new White Paper on innovative health financing models for achieving Universal Health Coverage (UHC) in Kenya has been launched at the Sankalp Africa Summit by the SDG Partnership Platform, in cooperation with Intellecap. The White Paper highlights the need for the Government to continue to significantly increase its budgets for health to deliver on the country's ambition to realize UHC, while it taps into complementary sources of financing to optimize the existing resources and bridge critical gaps. Social Impact Bonds (SIBs) which can improve the efficiency of government healthcare spending at the county as well as national levels and facilitate result-oriented programmatic funding and support. Advance Market Commitments that guarantees product providers a long-term market and price. Under this arrangement, funders will commit to purchasing a large portion of the product for a set price, if the product can meet their requirements. This reduces the risk for those developing new medicines, medical devices, technology solutions or other products and enables them to leverage economies of scale from a large order. Asset Lease Financing is a type of a direct financing to procure medical equipment and other tangible assets such as ICT used in healthcare service delivery. Instead of incurring an up-front cost, the cost is spread over several years. This enables the immediate delivery of the products even if all the funding is not entirely available. Contracts can be structured so that payments are dependent on the product use, maintenance, upgrades and also training for users which can improve the utilization of the asset. The Government of Kenya is committed to implementing UHC as one of the pillars in its Big Four agenda. This will ensure that all individuals and communities in Kenya have access to the quality essential health services that they need without suffering undue financial hardship. This access to and use of health services will enable Kenyans to be more productive and active contributors to their families, communities and society at large. To guide the implementation of the UHC agenda in the health sector and the country at large, the Kenya UHC roadmap was developed. The process of developing the roadmap was consultative and participatory under the stewardship of Hon Sicily Kariuki, Cabinet Secretary, Ministry of Health, Kenya. The roadmap spells out the UHC goals and aspirations for the country, and further provides the strategic interventions and priority areas of implementation required to achieve them. There is a growing need for innovative health financing models where traditional healthcare funding and, more importantly, government funding has to be optimally utilized. Innovative health financing is an emerging approach to funding health interventions, through pooling of funds from diverse sources. It involves the "mixing or blending" of two or more sources to fund the program and or activity in consideration and has been used in several countries across the world - including developed, developing and LMIC countries. Speaking at the launch of the White Paper at the Sankalp Conference in Nairobi, Arif Neky, SDG Partnership Platform Coordinator said: "We are committed to helping Kenya accelerate the attainment of the SDGs through building multi-stakeholder and cross-sectoral partnerships which catalyse investments and innovations. The White Paper has been developed with the inputs of many of our Government, Private Sector, and Civil Society partners and provokes excellent thinking giving the ecosystem new ideas on how to shape the 21st century partnerships and financing models for the delivery of Kenya's Big Four Agenda". Dr. Rajat Chabba, Intellecap Lead for Healthcare Innovations, added that "adopting innovative financing mechanisms in a country requires collective participation of all the key stakeholders; investors, government, service providers and ecosystem players. A systematic approach will enable effective flow of private sector capital - and in Kenya all elements are there to make this happen". During an ensuing panel discussion, Adam Lane, Senior Director of Public Affairs at Huawei, one of the private sector partners of the Platform supporting the paper, explained that "new financing models not only unlock new forms of capital, but they bring other benefits such as aligning incentives between different stakeholders in the health system, improving efficiency of health service delivery, and tapping into new forms of expertise." He added, "we have seen how innovative financing has transformed other sectors such as solar energy and now healthcare also needs to explore these opportunities; M-Kopa alone has raised over US $150m for their model which is a variation on asset lease financing allowing more than 500,000 households to use mobile money to pay for solar energy systems, smart phones, stoves and TVs in instalments". The article was authored by Humphrey Odhiambo, posted on https://www.cio.co.ke/opportunities-for-innovative-financing-for-universal-health-coverage-launched-in-kenya/ on the 23rd of February 2019. The views expressed in this article and the report attached are the author's own and do not necessarily reflect those of the SDG Partnership Platform, a spin-off of the SDG Philanthropy Platform in Kenya is a knowledge partner of Sankalp Africa Summit 2019. The SDG Philanthropy Platform is a global initiative that connects philanthropy with knowledge and networks that can deepen collaboration, leverage resources and sustain impact, driving SDG delivery within national development planning. It is led by the United Nations Development Programme (UNDP) and Rockefeller Philanthropy Advisors (RPA), and supported by the Conrad N. Hilton Foundation, Ford Foundation, Oak Foundation, Brach Family Charitable Foundation, and many others.